Submitted by atrius on Sun, 09/04/2005 - 00:00. Oh, if only more people agreed. Or knew for that matter. On this subject, here is a link to some constitutional amendments I'd love to see pass. Submitted by atrius on Fri, 09/02/2005 - 06:58. Tomorrow is my birthday for any who would care to know. I'm also thinking of trying to have the LAN party equivalent of a pickup game this weekend. Don't feel bad if you can't make it, this is last moment after all. I'll be sending out a notice on the mailing list sometime later today. If you can make it, just respond there on. If not, don't worry about it this time. And no, this will not be a birthday party for me so no one get any ideas. Submitted by atrius on Wed, 08/17/2005 - 20:56. Once everyone has signed up for the list, please provide IM information to make things faster. Anything aside from MSN is fine. Submitted by atrius on Wed, 08/17/2005 - 09:12. The forums are up now. You'll have to register an account on there, you do not need an account on the drupal site to use the forums. Submitted by atrius on Tue, 08/09/2005 - 09:21. Contrary to popular opinion, my upcoming job change will not effect plans for future LAN parties, they will go ahead on schedule... Once I make them in the first place. Stay tuned to this site for more information. Submitted by atrius on Tue, 08/02/2005 - 22:28. 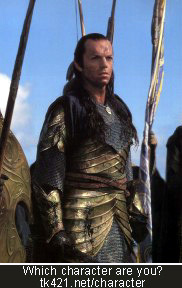 It would seem I am Elrond.